Home / Health A-Z / We found 13 best essential oils for your daily skin care routine. Here is how to use them? What are the best essential oils for skin care and how to make the right choices? Best essential oils for dry skin care? How to make essential oil remedies for various skin problems? 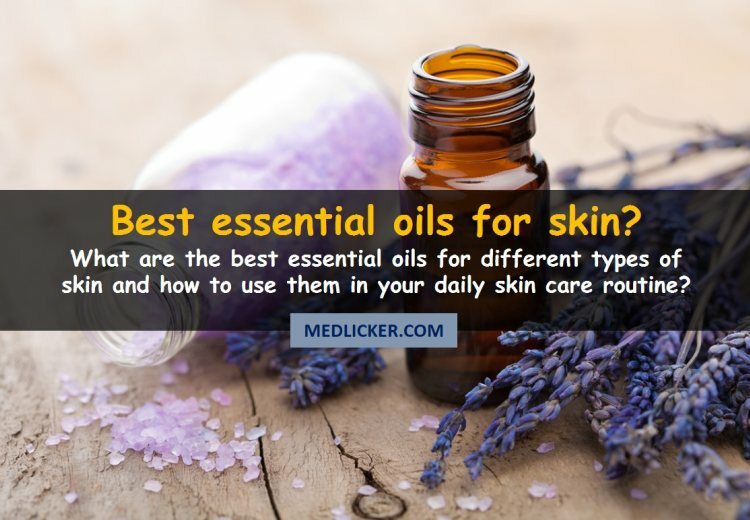 How to buy and store your essential oil skin care remedies? There are many different essential oils and you usually you will be able to find one for your particular skin problem. One thing you should know before selecting the right essential oil for you is your skin type. People with oily skin need different essential oils than people with dry skin. Essential oil selection also depends on your age as "older people" tend to have more wrinkles and their skin elasticity is not the same as while you are young which means that they need to use different essential oils. If you are pregnant make sure you only chose essential oils safe for pregnant women and their unborn children. And last but not least you should always consult essential oil use with your dermatologist (e.g. skin doctor) as there are some skin conditions (such as cystic acne), which may get worse if you attempt to cure them with essential oils. Bergamot oil is made from the rind of Citrus Aurantium (Citrus Bergamia) fruit. It has a strong pleasant aroma and is added to many perfumes (or can be used at home as a natural deodorant). Thanks to its anti-inflammatory and antiseptic properties it kills the germs on your skin and is, therefore, a great remedy for your oily skin disinfection (1). Bergamot essential oil has also been studied for use in the treatment of anxiety and depression and studies found that this oil seemed to be an effective treatment for these issues (2). And as other studies show that anxiety and stress are closely related to oily skin (they may cause increased sebum or skin oil production), bergamot oil may actually be good for oily skin (3). If you use bergamot oil in small amounts as recommended the risk of adverse reaction is very low. However, some people may suffer from a phototoxic reaction to bergamot essential oil (4). Therefore bergamot aromatherapy may make your skin more sensitive to sunburnand more vulnerable to blisters, blemishes (skin discoloration and pigment spots) and even the skin cancer. So make sure you use sunblock creams and wear protective clothing if you regularly use bergamot oil. You should also not use bergamot oil if you are pregnant or breastfeeding as it may not be good for your baby. If you suffer from diabetes (high blood sugar levels) use bergamot oil with caution as it may lower your blood sugar levels too much, resulting in hypoglycemia (dangerously low blood sugar). Cypress essential oil is made from a coniferous tree called Cupressus sempervirens. It speeds up skin cut healing, fights infections, varicose veins, and cellulite (5). Antioxidants are molecules, which destroy harmful free radicals in your body and assist in the prevention of serious diseases, such as cancer. Studies confirm that cypress essential oil may also be an effective cure for anxiety and depression, which makes it another good option for oily skin (7). Before you start using cypress essential oil topically (e.g. on skin or in a bath) you should first check that it does not irritate your skin. Ask your dermatologist to perform a patch test and always dilute cypress oil before topical use. The best carrier oils for dilution of cypress essential oil are jojoba and coconut oils. Do not use cypress essential oil while pregnant or in children! Frankincense essential oil is made from the resin of Boswellia trees (e.g. Boswellia carterii or Boswellia sacara). Like many other essential oils, frankincense oil fights depression and anxiety. It also slows down aging by improving skin elasticity and blemishes. 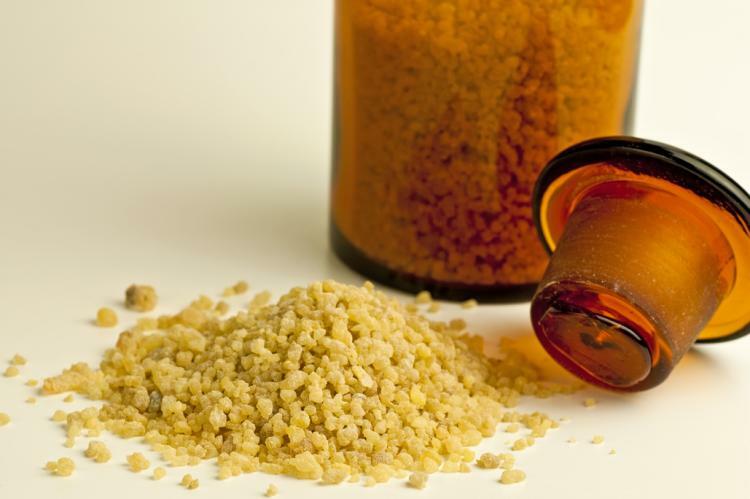 Frankincense oil also fades stretch marks, scars, and acne. It contains boswellic acid, which has astringent and anti-microbial properties (8). Side effects associated with frankincense oil are rare. Its topical use may sometimes cause skin issues, such as rash or irritation. It may also interact with blood-thinning medication so consult your doctor before use if you are on blood thinners. Pregnant women should not use frankincense essential oil. Lemongrass (Cymbopogon citratus) is a powerful medicinal herb commonly used in India and Asia. Lemongrass essential oil is rich in essential nutrients, including vitamins A, B1-6, folic acid and vitamin C.
It has antiseptic and astringent effects and strengthens your skin (9). It cleanses skin pores and is part of many soaps and skin lotions. Lemongrass essential oil also has analgesic properties (e.g. pain killing effects) and may alleviate muscle pain. It is also used as a cure for anxiety, stress, and insomnia. It contains citral, a powerful antioxidant, which has anti-cancer properties and may prove helpful in skin cancer prevention (10). Lemongrass essential oil may cause skin rash or irritation in sensitive people. Therefore you should ask your doctor to perform a patch test before use. As the majority of other essential oils, lemongrass oil should not be used in pregnant women as it may increase the risk of miscarriage or bleeding. If you are a breastfeeding mother you should not use lemongrass oil, either. Peppermint essential oil is made from the leaves of Mentha pipertita plant from Labiatae family. Mentha pipertita is a hybrid of spearmint and water mint plants and contains some great molecules with powerful medicinal properties (11). Thanks to its cooling sensation it has soothing effects on skin inflammation and may also relieve symptoms of eczema and psoriasis. It can also be a powerful remedy for the natural treatment of acne. Peppermint essential oil hydrates your oily skin and may ease the pain caused by sunburns and promote the skin renewal process. When applied topically (e.g. on the skin) peppermint essential oil is generally safe. However, it may interact with some common medication, such as NSAIDs (non-steroidal anti-inflammatory drugs, such as celecoxib - Celebrex, Motrin, Ibuprofen, Voltaren, etc. ), blood-thinners (such as warfarin/coumadin), calming and anti-anxiety medication (such as Valium, Diazepam, etc.) and many others. If you take any medication, ask your doctor about possible interactions with peppermint essential oil and do not use essential oils until your physician gives you his/her consent. Pregnant and breastfeeding women should not use peppermint essential oil. The summary: Some of the best essential oils for oily skin care are Bergamot, Cypress, Frankincense, Lemongrass and Peppermint essential oils. They all have stress and anxiety relieving properties, which results in the decrease of sebum production. On the other, hand they keep your skin hydrated. Do not use these essential oils while pregnant or breastfeeding and use them only with prior consent of your physician. Cedarwood essential oil is made from coniferous trees called Cedrus atlantica. It is rich in molecules called Sesquiterpenes, which are mostly responsible for its medicinal benefits. Cedarwood essential oil has many powerful benefits for your dry skin. Thanks to its anti-inflammatory properties it helps to deal with skin infections, which may cause serious disorders, such as seborrhoea. Cedarwood essential oil also has astringent properties, which means that it promotes the formation of a protective layer on the skin (preventing penetration of harmful microbes and dirt into deeper layers). It also stimulates skin metabolism, tones the skin (helps hide blemishes) and boosts your overall mood. Cedarwood essential oils speed up skin wound healing and act as a powerful antiseptic agent. These antiseptic and anti-inflammatory properties make Cedarwood essential oil a great cure for non-cystic acne. It is also an excellent remedy for dry skin (and scalp), thanks to its moisturizing and anti-microbial properties. Cedarwood oil is very strong and must not be used internally (e.g. do not put it in your mouth or swallow it!). Use it topically (on the skin) after being diluted in appropriate carrier oil. If used excessively, Cedarwood essential oil may cause skin irritation. Jasmine essential oil is made from the jasmine flower (Jasminum officinale). It has some powerful health benefits and is used as a natural cure for insomnia, stress, and anxiety in many parts of the world. 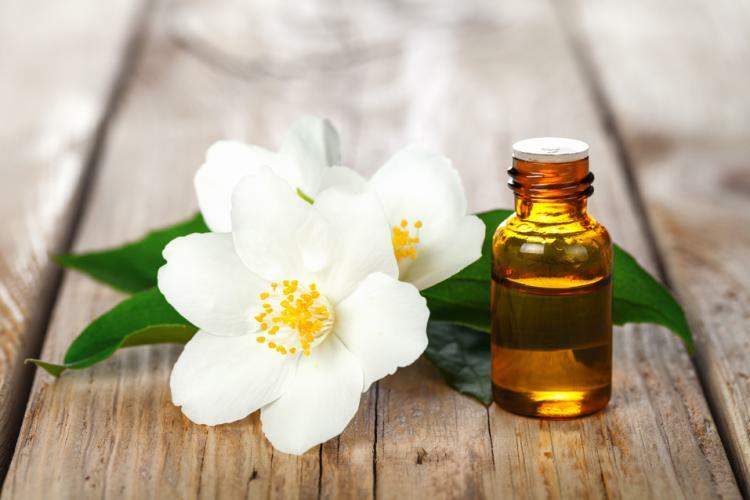 As far as its skin properties are concerned, Jasmine essential oil may ease skin irritation (such as razor burns or bug bites). What is more, it contains secoiridoid glycosides, strong antioxidants, which destroy free radicals and boost immune function (13). It also reduces skin discoloration (blemishes) and speeds up bruise healing. Jasmine essential oil may irritate your skin if used undiluted or in excessive amounts. Therefore make sure you dilute it in some carrier oils before use. The best carrier oils for Jasmine essential oil are coconut, almond or jojoba oils. Do not use Jasmine essential oil while pregnant or breastfeeding without the prior consent of your physician. Myrrh oil is made from dried resin produced by Commiphora myrrha tree. It has powerful antioxidant benefits and protects cells from harmful free radicals (14). Myrrh oil is a common active ingredient in many body lotions and skin care products. It fights bacteria, fungi, and even parasites and helps keep your skin in good shape. Studies show that myrrh essential oil may have some healing powers and speed up skin wound healing (such as skin cracks) (15). It also has moisturizing properties, which make it a great essential oil for dry skin. Myrrh essential oil may have some adverse effects and interactions. Do not use it if you suffer from diabetes (it may lower blood sugar too much and cause hypoglycemia). Also, you should not use myrrh essential oil if you suffer from cardiovascular problems, such as arrhythmias (irregular heart beats) and/or if you take blood-thinning medication. Do not use myrrh essential oil while pregnant or breastfeeding. Always consult your physician prior use of Myrrh essential oil and ask him or her to perform a patch test to avoid allergic reactions. Rose essential oil is made from the petals of rose plants. It has some antimicrobial and anti-inflammatory properties, which make it a great skin care product. It is also a great remedy for depression and anxiety. Rose oil also helps fade skin scars, blemishes and can be used as a natural remedy for non-cystic acne management. Do not use this oil in concentrated form but always dilute it in carrier oils (coconut, almond or jojoba oils are the best ones). Do not use rose oil while pregnant or breastfeeding. The summary: If you have dry skin, try cedarwood, jasmine, myrrh or rose essential oils, which will keep your skin moisturized and promote its healthy look. Chamomile essential oil is made from the flowers of Roman Camomile (Anthemis Nobilis) or German Camomile (Matricaria Chamomilla) plants. Chamomile oil has anti-inflammatory, antioxidant and astringent properties and has been used for thousands of years to treat skin irritations, wounds, bruises, burns and other disorders (16). It is also a great essential oil to use if you want to improve your skin color and get rid of discoloration and age spots. The scent of chamomile essential oil stimulates the brain and research shows that it is a great natural remedy for depression and anxiety (17). Studies also confirm that chamomile oil may improve the quality of your sleep (18). Thanks to its astringent properties and soothing effects, chamomile essential oil is considered to be one of the best choices for oily skin. Chamomile essential oils are generally safe but pregnant women should not use them as they may cause bleeding issues. Chamomile oil may also interact with blood-thinning medication so you should not use it if you are on Coumadin (warfarin) or similar medication (19). Also, some people may be allergic to chamomile oil so if you experience any irritation, redness or other symptoms of allergic reaction (such as breathing problems, sweating, etc. ), stop using the oil immediately and seek immediate medical attention. Geranium essential oil has strong anti-inflammatory and antimicrobial properties, which make it a great addition to your daily skin care routine (20). It is made from the leaves of various Pelargonium plants, mainly from Pelargonium odorantissimum and graveolens. It suits any skin type (oily or dry), fades the scars and age spots, reduces wrinkles and supports skin cell regeneration. Undiluted geranium essential oil may cause skin irritation or burns. Always perform a patch test before you start using this essential oil. As geranium essential oil interacts with hormones and blood vessels, pregnant women and people suffering from cardiovascular diseases, like atherosclerosis and myocardial infarction should not use this oil. Always ask your doctor for consent before you start using geranium essential oil. Sandalwood essential oil is made by steam distillation of heartwood of various sandalwood trees. It has many skin health benefits. Thanks to its antiseptic and anti-microbial properties it lowers symptoms of herpes, warts, pimples and boils (21, 22). Sandalwood essential oil is rich in antioxidants, which promote healthy skin look by destroying free radicals and promoting healthy skin cell growth. The rule of thumb is to test all essential oils before applying them topically on your skin. So perform a patch test first to see whether you are not allergic to sandalwood essential oil. Do not use sandalwood essential oil while pregnant or if you are allergic to any of its compounds. Lavender oil contains powerful antioxidants, which reduce stretch marks, wrinkles, and cellulite. It suits any type of skin and is an excellent oil for the healing of burns and cuts. Lavender oil also reduces symptoms of eczema and psoriasis. Thanks to its pleasant scent, it improves sleep and mood and alleviates headaches. Do not use lavender essential oil with sleep medication as there is a risk of interactions (e.g. lavender may make you sleepy and you will be even more sleepy if you take sleep medication with it). Do not use lavender essential oil in pregnancy as it may interact with your hormones. 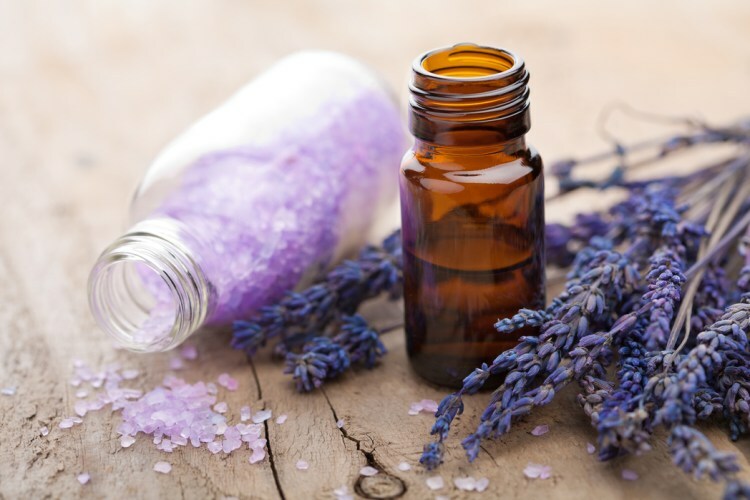 As with any other aromatherapy oils never use Lavender essential oil topically without diluting it first in a carrier oil (coconut, jojoba, almond or grapeseed oils are the best carriers). Ask your doctor for advice before using Lavender essential oil. The summary: Lavender, sandalwood, geranium, and chamomile essential oils suit any type of skin. There is a special essential oil remedy for each skin disorder. Here are some instructions on how to make essential oil remedies at home for some of the most common skin problems. If you want to get rid of burns, eczema or rashes fast, add 5 drops of lavender oil into one tablespoon of coconut oil. You may also use jojoba or almond oils as carriers for this remedy. Apply this mixture topically (on affected area of skin) three times a day until you see improvement. Add 10 drops of tea tree or sandalwood essential oils into your warm bath. Soak in for 15 minutes. Add 3 to 5 drops of geranium, tea tree, lavender or sandalwood essential oils into your daily skin lotion or cream. Apply twice a day until you see improvement. Dilute 5 drops of frankincense essential oil in 1 tablespoon of jojoba (or almond) oil. Stir well and massage into your wrinkled skin. You may also use this remedy to improve the look of saggy areas, like abdomen, neck or under the eyes. Mix rose essential oil with a carrier oil (jojoba, almond, coconut or grapeseed) in 1:3 ratio. Massage into problem skin areas. Rinse off after 12 hours (or in the morning). Add 10 drops of myrrh or geranium essential oil into a tablespoon of extra virgin olive oil. Massage the mixture into your skin in the morning and in the evening. Rinse off before going to bed. You may try to use aromatherapy to reduce the symptoms of non-cystic acne (never attempt any natural treatment for serious cystic acne - it may actually worsen the problem). If you have serious acne ask your dermatologist for proper medical treatment. Add 5 drops of tea tree oil to 1 tablespoon of raw honey. Stir well and apply on your acne on face. Wash your face after 15 minutes. Repeat two times a day until you see some improvement. Mix 3 drops of (each) lavender, tea tree and frankincense oil in 2 tablespoons of jojoba oil. Apply on your acne scars before going to bed. Repeat until you see some improvement. Try to prepare only a small quantity of each remedy (enough for a day or two). Essential oils should be stored in sealed brown or dark glass containers (bottles) and never in plastic or metallic containers. Protect essential oil blends from direct sunlight (store them in dark and in the refrigerator). Buy essential oils from proven makers. The best is to buy in a store first and if you are happy with the quality you may buy online in the future. There is not a single best essential oil remedy for skin disorders. You will have to try some of the recommendations above and chose the ones, which work for you. If your skin is oily, use bergamot, cypress, frankincense, lemongrass or peppermint essential oils. On the other hand, if your skin tends to be dry, try out cedarwood, jasmine, myrrh or rose essential oils. Chamomile, geranium, sandalwood and lavender suit all types of skin. Always dilute essential oils you buy from a store in a carrier oil or water. In general, the dilution ratio (essential oil/carrier oil) should be between 1:4 - 1:5. Start with 1:5 and if your skin tolerates the remedy well, you may prepare a stronger remedy (1:4). You may also add about 10 drops of a healing essential oil of your choice to your bath water or pour 5 drops of essential oil in your regular skin lotion or cream. Store the essential oil remedies you make in a dark and cold place (refrigerator is the best option). Use seal-tight glass containers to store your essential oil blends. Essential oils should not be ingested or used in pregnancy. You should also carefully check possible interactions with the medication you take. Therefore we suggest you ask your doctor for consent before attempting to use essential oils on your skin.